I recently ran across an article posted by Marketing Profs on How to Evaluate and Select a B2B Teleprospecting Partner. With all of the recent hype about Inbound Marketing many people have forgotten the all so important discussion around Outbound marketing and teleprospecting as a whole. This is one of the reasons I found this article both intriguing as well as inspiring. While telemarketing and teleprospecting in the B2B space does not include the glamor or popularity that social media and inbound marketing does, it still holds a very important place in your overall marketing budget. Track, measure, and refine your marketing and sales plan - the days of bundling all of your marketing activities into one shared marketing calendar are gone. With the overwhelming number of marketing activities out there, it is important to learn where your leads are coming from, which activities yield the highest number of leads, and which yield the highest level of quality. Don't be surprised if you find that you have multiple tactics paving the way to your sales and marketing success. Build a sales and marketing SHARED goal - I won't bore you with the old "let's bridge the gap" conversation. In fact, it seems these past years companies have been working on ways to focus solely on building a new bridge, one that never had a gap to begin with. One of the best ways I have seen this is through Hubspot's smarketing. A key component to smarketing is creating a sales and marketing shared goal, and building your own internal SLA (service level agreement) around that goal. This helps not only hold each other accountable for your combined efforts, but also creates true camaraderie between the teams! Don't shy from traditional outbound lead generation - Despite what you may here, the cold call and teleprospecting is NOT dead. Not even close. 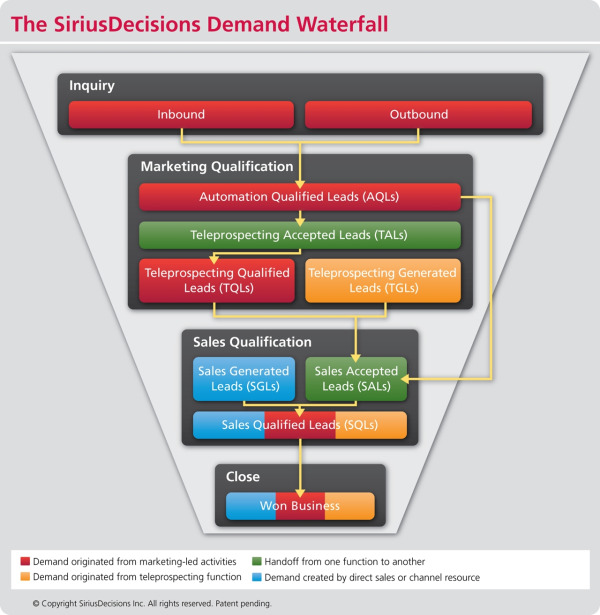 Why else would this be incorporated as such a large part of the SiruisDecisions Demand waterfall? As mentioned previously, it may not be as glamorous, but nothing speaks quality like a conversation with a person (with a need) that can then turn into a face to face meeting. While outbound teleprospecting may be a bit pricier, the time to generate a quality lead and move it further into the funnel is faster. Don't forget this very important tactic in your marketing efforts. Incorporate both inbound and outbound into your 2013 plan - As mentioned perviously, outbound and teleprospecting plays a very integral role in lead generation and in generating sales qualified leads (SQL). However with the rise of inbound marketing, it is important that you start to incorporate inbound marketing into your overall marketing and sales plan along with your outbound activities... and TRACK them separately. If you haven't done much with Inbound marketing, I recommend checking out Social Media B2B where you will find many nuggets of useful information. As with all plans however, the foundations are only as good as the plan to execute will make them. Always assure you have both the plan in place but also the team available to execute when ready.